It’s nearly the Holiday season, and you’re probably already anticipating the long drive or flight home to see your loved ones. However, packing can get a little difficult when your bedroom looks like someone took all your belongings and meticulously scattered them all over the floor and every other available surface. Between classes, studying and, most importantly, of course, socializing, tidying and cleaning has most likely been the last thing on your mind. Plus, cleaning supplies can get expensive. But there are some products that can make your room super easy to keep clean, at minimal cost. You’ll set a great example for your roommate to keep their half neat, and, if you conquer it now, you’ll have a lovely clean room to come back to after New Year. 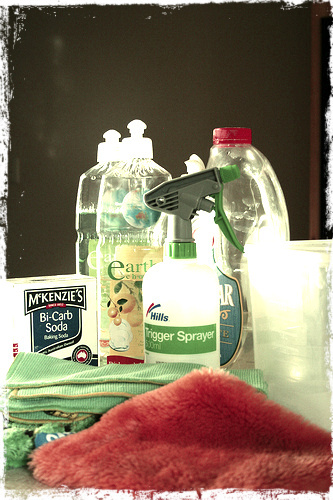 Here is everything you need for a clean room. This might seem like an odd addition to a cleaning list, but baking soda can be a powerful cleanser and deodorizer – as well as being cheap. Sprinkle on smelly or stained carpets and vacuum up for spotless, fresh floors. To remove any stubborn grime from surfaces, mix into a paste with some vinegar, rub on, leave for a while, and wipe off. You can even use it as an extra stain remover in your laundry. White (clear) vinegar is a great descaler, de-grimer and also an antibacterial agent. Clean and sanitize your grimy windows, mirrors and surfaces by spritzing with a mix of half vinegar, half water, and wiping off. Paper towels can be a godsend – don’t rely on facial tissues to clean up spills. Scrunch up and place in damp shoes after your morning run to absorb moisture and stop them smelling. Use with a vinegar solution to clean windows and mirrors for a streak-free finish, and keep on hand to wipe up spilt food or drinks. Some dusting cloths just seem to move the dirt around. Microfiber cloths make your job a lot easier by attracting the dust to the cloth, but you can also use them for general cleaning purposes. You can use them damp or dry, and clean them in neat white vinegar to keep them fresh and bacteria free. You will find 100 uses for a large bucket, from turning it into a drinks chiller, to filling it with a vinegar-water solution to clean up your carpet after one too many of those drinks were consumed. If you’ve got any marks on your walls or furniture that you think might cost you your rental deposit, try a Magic Eraser on it. It’ll remover everything from ground in dirt to pen marks, so if you got a bit overzealous whilst drawing up your revision timetable, simply wet this clever sponge, wring out, and scrub away. It’s a fact of life – you’re not always going to have time to run to the bathroom and fill your bucket with water to clean that mess up. Keep a pack of disposable antibacterial wipes in your room for those times when you have to be in class in five minutes, and you’ve just spilt your breakfast everywhere. Is there anything else you’d add to this list of cleaning essentials after experiencing life as a freshman? Louise Blake is UK based a mum of one who remembers her college times as if they were yesterday. She knows it can be hard to find decent home, office and hotel cleaning, London based in particular, which is why she uses the cleaning tips she’s collected to blog for Evocleaning.